I have to admit that I’m not at all crafty, a little sneaky perhaps but not crafty. Actually what I mean is that I prefer to buy things rather than make things! As luck, or good judgement, has it, my hubby is very crafty – not at all sneaky – but very clever in making things. A very handy person to have around, for many reasons. 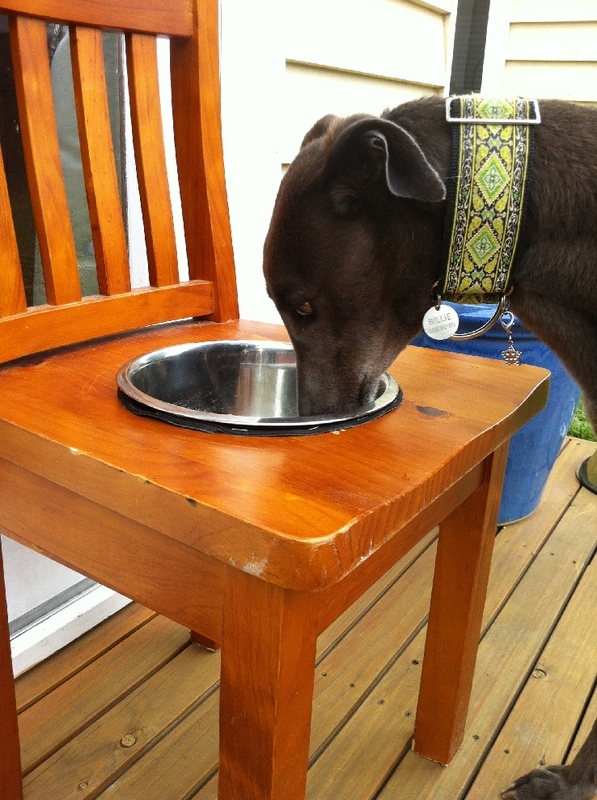 This weekend’s good reason was that we needed a stand for our foster greyhound Billie’s food bowl. Greyhounds are a bit like giraffes in that it’s awkward for them to eat from a bowl on the ground and it’s actually not good for them – it can cause bloat. When we adopted April two years ago, hubby made a stand for her bowl from an old wire pot plant stand – perfect – it holds the bowl in place and is just the right height. 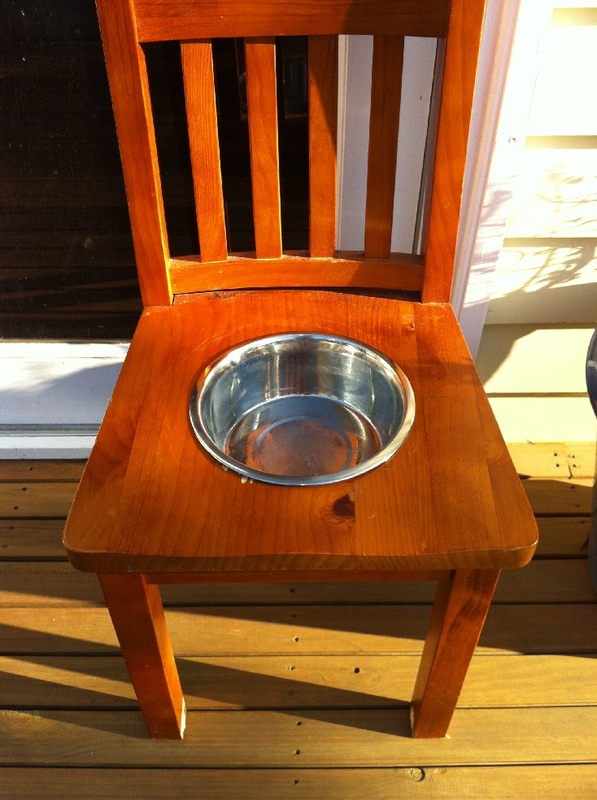 We have searched for a similar stand for Billie’s bowl but have not been able to find one. So, with a little plagiarism from a greyhound facebook site, we scoured the local St Vinnies for an old chair and for $20 found just the perfect thing. We have recently built a very large garage in the back garden, so hubby has the perfect workspace to create very useful things. Amazing what a bar stool, a jigsaw, and an old bike tyre can be used for! If I was really crafty, I would strip it down, buff it up, paint it pretty colours and maybe even stencil Billie’s name on it. But like I said, I’m not crafty! What have you made that you’re proud of? 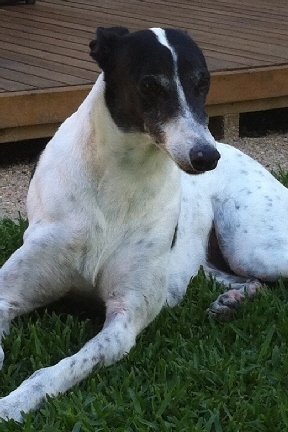 Categories: General, Health & Well-being | Tags: DIY, greyhounds | Permalink. How Did The Chicken Lose Its Head? It all started with the discovery that although we thought Billie was using our bedroom as her safe ‘cave’ she was also using our bed as a chewing post! Must be quite tasty for a young greyhound! So we went to the produce store and bought 3 toys for the 3 dogs so they could chew on those instead of the furniture (we have since also discovered some chew marks on our dining room table!). This should keep 3 dogs happy for a while…. But within 10 minutes, the plush cushion had no squeaker or stuffing (that was all over the floor), and the Chicken Had No Head! Or arms, or legs! The plush bone was rescued just in the nick of time. Who could have done such a terrible thing to poor Chicken? Was it sweet Aunty April? 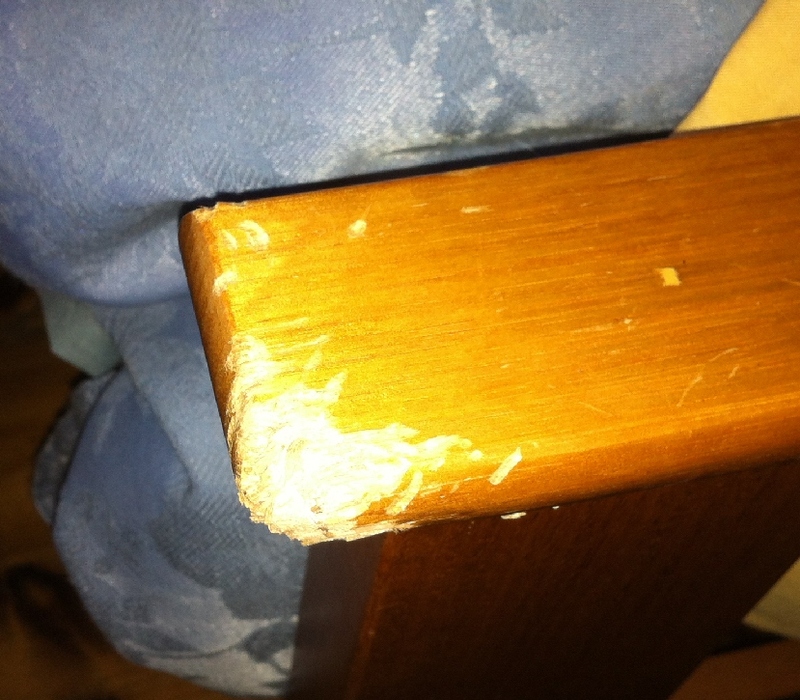 Was it cheeky 2 year old, furniture-chewing greyhound Billie? Or was it wily Uncle Rupert? Ah Ha. Caught in the act Rupert! 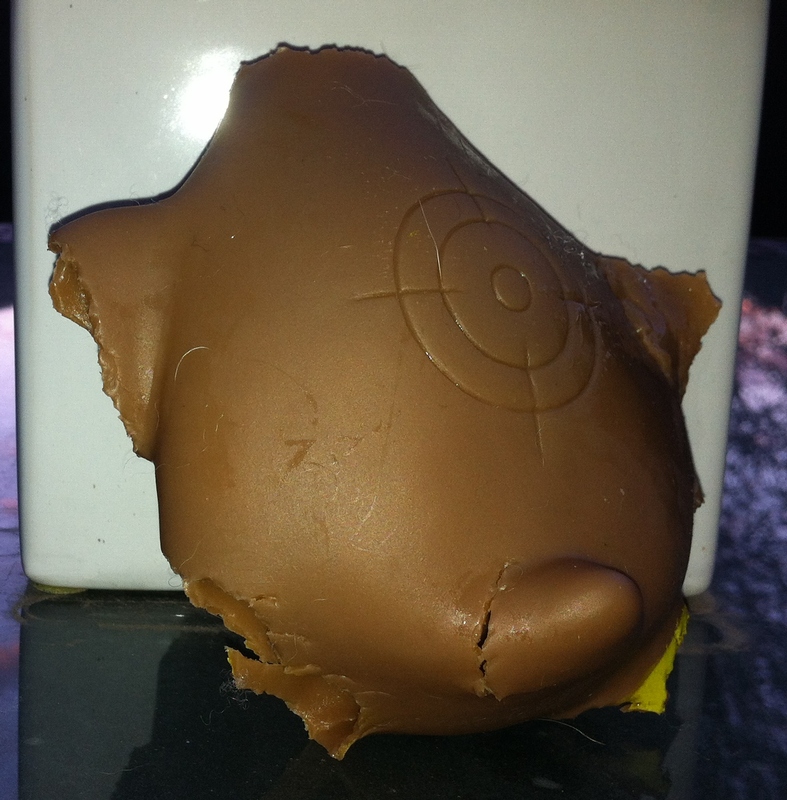 How long do squeaky toys last in your house? 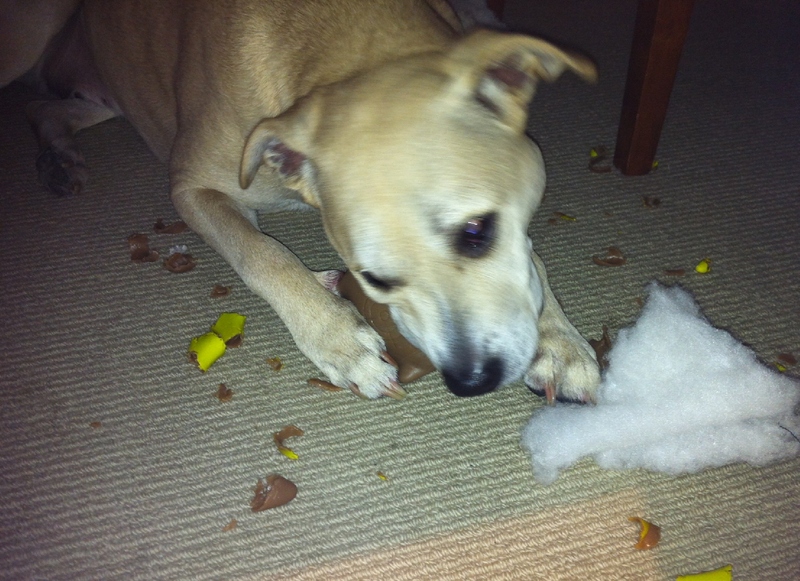 Categories: Short Stories | Tags: dog toys, greyhounds | Permalink. Ha Ha! April looks very toothy and goofy and this picture always makes me smile . There is a serious message in this photo though. It’s about dental health. 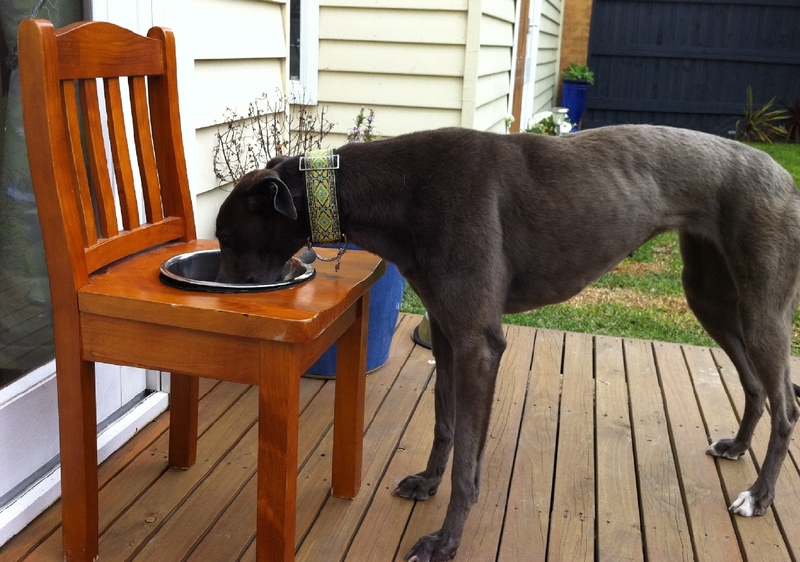 When April, like many greyhounds, are young, they are fed mainly soft foods. As they get older, their teeth deteriorate. They get a build up of plaque and their teeth start to rot. It’s interesting to note that dogs do not get cavities in their teeth, they rot from the gum and the teeth start to die. This results in infection, discomfort, pain and ‘dragon’ breath – not nice for anyone! We adopted April two years ago when she was 8 years old and had to have 8 of her little front teeth removed – hence the goofy look! This week, she’s had to have her two incisors out. She will be happier in the long run, but it’s awful to have to put her through the pain of an anaesthetic and extractions. She was not a happy girl afterwards and it makes you feel so guilty about putting them through it – nasty mummy! I think she’s forgiven me now that she’s getting special guilt food of prime beef strips! And I got a lovely, minty-fresh- breath kiss when I came home from work today! To maintain good dental health, dogs should be given a diet which contains mainly dry food, some uncooked bones of a size applicable to the size of the dog, dental stix or similar and if you’re game, some dental brushing. If your dog can maintain good dental hygiene, you will save a lot of money on dental bills and you’ll have a happy and healthy doggy with a lovely canine smile! Of course, always consult your vet if you have any concerns or need further advice. Say ‘Cheese’ for the camera April! 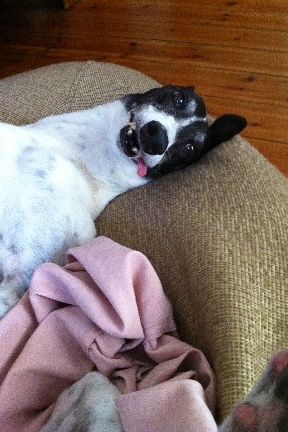 Categories: Health & Well-being | Tags: bad breath, dental hygiene, goofy, grehounds, greyhounds | Permalink.